Casino Hold’em is a very popular casino game that has been around since the 1990’s where it was used as a training tool. The game features the same rules as regular Texas Hold’em, but with the casino variation players challenge the house in lieu of other players around the table. 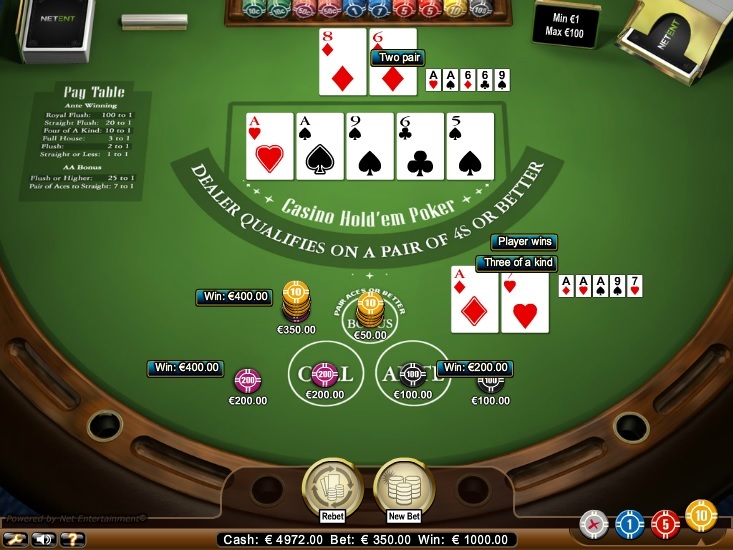 This makes the game much shorter, but still includes most of the options and rules offered by the standard Hold’em game. Online casinos as well as land-based feature additional opportunities designed to make the game more attractive. Some add progressive jackpot payouts for certain combinations while others offer a side bet option that will include the opportunity to win much bigger than just double your bet value. Players who understand the rules of regular Hold’em will very easily understand how the game works, but even those players who have never played Poker will be able to pick up on the game a lot easier on the casino variation as betting rounds and options have been simplified and shortened. This makes the game a lot faster, and more exciting as none of the usual tricks are needed, such as the famous Poker face. Casino Hold’em was invented at the turn of the previous century by Stephen An-Yeung, who wanted to teach his partner Texas Hold’em. What began as a training tool later evolved into an entertaining casino game. It was launched in the land-based casinos of South Africa, Egypt, and Russia and even exhibited at the International Casino Exhibition held in London in 2002, which is where the game became more well-known and offered to players in casinos from around the world. Since the game was developed around the same time online casinos became available, online casinos also assisted in making it popular by offering the game within their table game selections. There are many providers of online casino gaming software today, and it is played in more than 1000 online casinos and brick-and-mortar casinos all over the world. Today Casino Hold’em can also be enjoyed as a live dealer game, which is an online variation that includes an actual dealer to provide a professional land-based casino game on computers and mobile devices. To ensure you understand how the game works, you will need to know the rules, which will also explain why certain things happen the way they do while playing. Another important part of the game is understanding the rank of each hand, which would provide you with the ability to see when a hand is worth playing and what possibilities the dealer might have in regards to combinations. The game only has a few rules that need to be remembered, which could provide an advantage for you with some hands. This includes the fact that the dealer requires a pair of 4’s to qualify for the hand, meaning a high card or a pair of 3’s or lower will not count and would result in an automatic win for players, regardless of their hand. However, only the Ante bet will be doubled, and the call bet will be pushed, meaning the player can remove it. Should your hand and the dealer’s hand consist of the same value, this will result in a push, meaning no one wins. A call bet will be required by all players who wish to continue to the next section of each hand. This means there are no check options as without the call bet in place you would automatically fold and lose the ante bet. Casino Hold’em is played with a standard deck of 52 cards that does not include Joker cards. In front of each player seat options will include an Ante bet, Call bet, and any side bet options offered by the table, which is optional and can only be wagered on before the next round starts. To ensure you receive cards for the next hand, place a bet within the limits on the Ante bet section. The dealer will not provide 2 face-down cards to each player and to the house, which is followed by the first 3 community cards on the table. Your objective is to create the bet Poker hand with your 2 cards and the community cards on the table. Should you have a hand worth playing, place a bet matched to your Ante bet on the Call section of the table. The dealer will now remove the cards from players who did not call and add another 2 cards to the community cards. All players who have accepted the call bet are not required to show their hands, which will be compared to only the dealer’s hand. This means your hand will not be compared to the other players. The dealer will provide winnings matched to the Ante and Call bet value to the hands stronger than his and the remaining players who have weaker hands will lose their bets. Should any side bets have won, the dealer will provide those winnings as well. There are many possible hands in Hold’em, which is imperative to know as this will determine how steady your hand is and whether or not to continue and place a bet on Call. Some Casino Hold’em games provide different payouts and even progressive jackpots with top-ranked hands as mentioned. The payouts mentioned below are fairly standard and are rewarded by the casino without an additional side bet. Side bet options usually have a pay table of their own and only reward with certain combinations. Hand rankings from weakest to strongest follows. High card winnings are not counted in the Casino Hold’em, meaning a pair or better is needed. Any pair will count for the player’s hand, but the dealer needs at least a pair of 4’s. A pair, two pair, three of a kind, and straight will provide even money will your hand beats that of the dealer. This means the house will match your total bet amount as your reward. A full house will pay 2;1, four of a kind will offer 10;1, a straight flush will pay 20;1. And finally a royal flush will provide 100;1. The three top hands are usually the ones involved with a progressive jackpot winning, or the game will state what is required to win the jackpot. Though similar to Poker, Casino Hold’em is not poker. Players cannot bluff, re-raise, or even play against opponents. The only strategy that can be followed is to decide wisely which hands they would like to play and which hands they would like to fold. Casino Hold’em experts say that the best strategy is to play as many hands as possible and discard only the really weak ones. Learning to check the table for all possible hands will also assist in making desitions while playing. For example, having the weakest pair on the table might not always be worth playing, but if you don’t see what other possibilities exist, you will never be able to see just how good or bad your hand is before placing the call bet. While standard Poker might have a huge number of strategies, Casino Hold’em is rather limited in this regard. Progressive strategies can be applied to the game, but this will require a huge bankroll even if your starting bet is $1.00. This is because the game is difficult to control as the cards you receive and what is placed on the table could count in your favour or simply force you to fold and lose the ante bet. Progressive betting systems require players to double up with each losing hand. It’s important to start low, and the values that keep doubling can reach massive amounts fast. You will be required to keep doubling up on your Ante bet and Call bet until you win a hand after which you will return to your starting point, which is the lowest bet. Professionals that use this system recommend that at least 8 rounds are required in your bankroll. This means you need to have enough funds in your account to double up 8 times. If the lowest bet if $1, it would mean you need to place $2 on your first round as the Call bet will be equal to the Ante bet. Should you lose 8 hands in a row, your bet values would include $2, $4, $8, $16, $32, $64, $128, $256. This will mean a total of $254 would have been wagered before your 8th bet. However, should you win on any of those bets, you will win back your losses up to that point and still make a profit. The 8th bet of $256 will produce winnings of $265, meaning you win back all your losses and make a $2 profit. This system can also be adjusted to include higher profits, but this would mean a higher starting point is required.